Our Calendar of Events page has been updated with the upcoming events of 2019! The board is excited to be bringing in several guest speakers to lead monthly discussion groups, and for the first time ever we will be offering several new rituals this year! Check out our Calendar of Events page and be sure to save the dates! Calling all mermaids, pirates, and folks who dream of their toes in the sand, the ocean is calling to us to spend A Night By The Sea. It’s the 3rd Annual Frolick Fantastical and we hope you come join White Oak Grove CUUPs at this fun for all ages, Halloween event. Our event is open this year with just a $10 suggested donation. Tickets will be sold for a fundraising raffle to help support future White Oak Grove CUUPs activities. 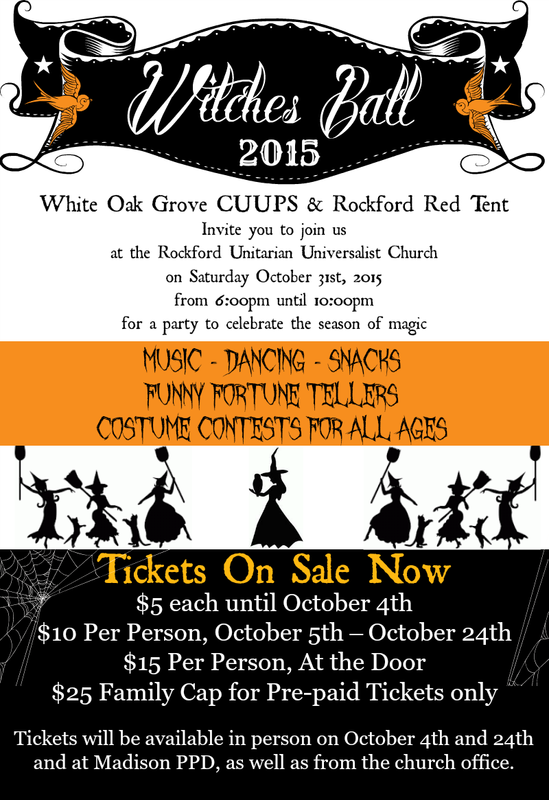 White Oak Grove CUUPS & Rockford Red Tent invite you to join is for a night of fun and dancing at the Witches Ball on Saturday October 31st, 2015 from 6pm to 10pm, at the Rockford Unitarian Universalist Church. We’ll gather the community and stir the pot of magic with music, dancing, snacks, funny fortune tellers, and costume contests (prizes for ages 12 and under, 13 through 18, and 18 and over, as well as some special categories), so be sure to dress up! We will also be honoring our beloved dead with an ancestral altar in the narthex of the church that will be up during the party and for services the next morning. If you would like to contribute to the altar please bring a copy of a photograph of those you with to honor to leave on the altar. We may not be able to get it back to you, so please don’t plan on leaving anything of value.